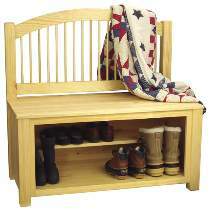 A practical bench for your entryway or mud room. Unique design better accommodates boots and shoes. Made primarily from 3/4" stock. Pictured in pine. All patterns drawn FULL SIZE. Measures 39"H x 39-3/4"W x 20"D. Order nine birch dowels separately below.